Help protect your bottom line and the planet with eco-conscious design innovations and Dell's Green Printing Program. Curb paper use with the Dell 3330dn's standard 2-sided print capability and in-driver print mode, which prints multiple pages on 1 sheet of paper. Enjoy user-friendly design and smart applications that help you reduce downtime and efficiently manage your operation. Intuitive User Experience: 4-line, LCD panel permits easy viewing, while a large button layout makes it easy to navigate printer menu and adjust settings. Network-Ready: Standard Ethernet 10/100 Base-T networking (internal) easily accommodates multiple users over a secured printing network. Easy Printer Management - Manage printers remotely with Dell - Printer Configuration Web Tool and receive automatic toner alerts with Dell Toner Management SystemTM. The Dell ™ 3330dn laser printer brings a new level of high-performance monochrome printing within reach of any company, from small businesses to large enterprises. It offers exceptional resolution, intuitive operation and very low print costs, enabling everyone in the workgroup to benefit from affordable, quality printing. In addition to high-speed performance and razor-sharp resolution, an intuitive 4-line LCD panel with number pad makes operation quick and easy, with a host of advanced technologies enhancing productivity for your entire organization including key benefits such as faster ‘first page out’ time, instant warm-up and duplex (print both sides) as standard. Moreover, the Dell 3330dn comes network ready, meaning faster deployment, hassle-free operation and ease of maintenance at a very affordable price. The Dell 3330dn delivers high-performance printing of up to 38 ppm with a duty cycle of up to 80 000 pages per month. This means less time waiting for print-outs and more time for productive work. And with a true print resolution of up to 1200 x 1200 dots per inch (dpi), the Dell 3330dn prints both text and business graphics with crystal clarity. Networking out of the box embedded networking capabilities on the Dell 3330dn enable everyone in a workgroup to print professional-quality documents quickly and conveniently. 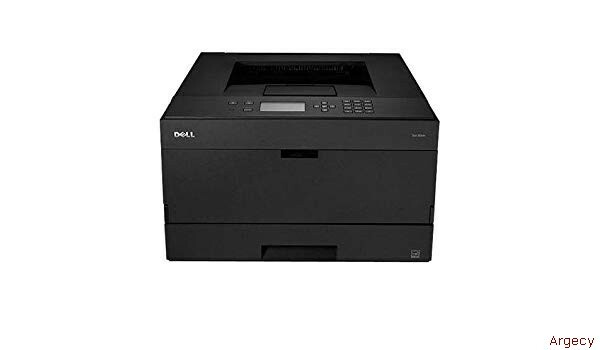 The Dell 3330dn is expandable with an optional 550 sheet paper drawer and additional memory for demanding high- capacity printing, so your printer can grow along with your business. The Dell 3330dn is equipped with a 4-line LCD panel that is easy to see and easy to use. It comes with a complete suite of management software including the Dell Toner Management system, which alerts you to low toner levels. re-ordering toner is simple. Just visit www.dell.com/supplies or order by telephone from Dell or through selected resellers. all this convenience adds up to less time fussing with your printer – and more time for getting work done. Lower Printing costs With an attractive price and low cost per page of printing, the 3330dn makes high-performance mono laser printing affordable not just for large companies, but also for small and medium-sized businesses. What’s more, a rugged design, great reliability and Dell’s comprehensive support services will help you protect your investment while you bring down costs. PRINT with The Environment IN mind The Dell 3330dn paper drawer supports both the use of recycled paper and the re-use of freshly printed paper. “n-up” multiple- sheet printing reduces paper consumption by allowing you to print multiple pages on a single sheet of paper. on average, energy star qualified imaging equipment is 25% more efficient than conventional models according to us environmental protection agency (source: www.energystar.gov). Like all Dell printers, the 3330dn has been designed to reduce the use of non-recyclable materials and to eliminate hazardous materials. Dell printer users within most western European countries can return toner cartridges to Dell for recycling at no cost, and we’ll even help you dispose of your old printers and other computer equipment in an environmentally responsible manner. standard interfaces hi-speed USB 2.0 port, parallel IEEE-1284, 10/100 base T rJ45 Ethernet port. Microsoft® Windows server® 2008, Windows server 2003, Windows server 2000, Windows® Xp 32 bit/64 bit, 2000, Microsoft (OS) support Vista® 32 bit/64 bit, Windows 7 (expected when released), Linux - ubuntu 8.10, 9.04, Debian Gnu/Linux 5.0 rh Linux 3.0, 4.0, 5.0 Ws SUSE Linux 8.0, 9.0, 10.0. SUSE Linux enterprise server 11, SUSE Linux enterprise Desktop 11, opensuse 11.1, novell net Ware 5.1, 6.x. Macintosh version (OS 9.2 and OS X 10.2 -10.6), UNIX( PSPPD for sun Solaris 8,9, 10.0) HP UX. Citrix Metaframe presentation server 3.0 & 4.0 (compatible) and 4.5 (certified), sap. TCp/IP Ipv4, IpX/spX, appleTalk ™ , LexLink (DLC), TCp/IP Ipv6, TCp, uDp, Lpr/LpD Direct IP (port 9100), enhanced IP (port 9400), fTp, TfTp, Ipp 1.1 (Internet printing protocol), Thinprint .print integration , hTTp, hTTps (ssL 7 /TLs), snMpv3, WIns, IGMp, booTp, rarp, apIpa (autoIp), DhCp, ICMp, Dns, snMpv2c, bonjour, DDns mDns, arp, nTp, Telnet, finger. The printer ships with a standard capacity toner cartridge (approx 7 000 pages based on ISO 19752 testing standard).